Did you know scientists estimate that by 2050 there will be more plastic than fish in the world’s oceans? About half of all plastic produced is for single-use or disposable items such as packaging. This month is ‘Plastic Free July’, a global movement that dramatically reduces plastic use and improves recycling, worldwide. It began with a handful of participants in Australia in 2011 and has since grown to millions of participants across the world today, one of which lives in Norwich. Claire and her family are taking part in Plastic-free July in a bid to reduce the plastic waste they create. They are exploring new, innovative ways to live their everyday life by finding alternatives to the everyday plastic items. A tough but exciting challenge! 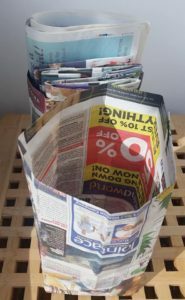 Claire tells us about the start of her journey, and what she now uses as alternatives to everyday bin bags and supermarket polythene fruit/veg grocery bags. “Having taken up the Plastic-free July challenge I felt quite overwhelmed by the amount of plastic items I use in my everyday life. So where best to start in my bid to kick my single-use plastic habit? It was time to take a long hard look at what I’m using and how I could do things differently but practically. Staring mournfully into my bin over the weekend, I had a moment of clarity when it dawned on me that I am buying plastic bin bags with the sole purpose of throwing them away! I hang my head in shame, but felt like I was lacking any real alternative. Suddenly I had a focus and without further ado set about looking for an alternative to single-use plastic bin liners. One week into the trial and the paper bin liners have been quite a revelation. Firstly they have caused us to question what we’re throwing away. We’ve been particularly on the look out for ‘wet’ items since clearly the paper bin liners would not have faired well in wet conditions. So far there have been very few wet items. All food waste has gone in to the wormery or food waste bin, effectively ruling out wet waste. 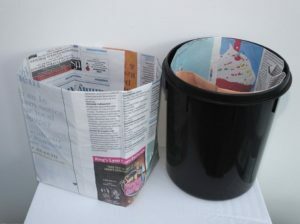 In addition, the paper bin liner being used in the bathroom bin has stood up well to steamy bathroom conditions and so far things are looking good for the paper bin liners as a long-term alternative to plastic bin liners. Admittedly they look a little unusual but that is a case of us changing our expectations as to what a bin liner ‘ought’ to look like. And an unexpected bonus has been that by changing our bin liners it’s caused us to rethink our bin provision entirely. 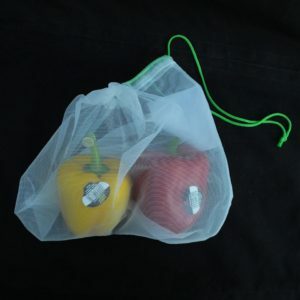 “This week we’ve been testing alternatives to single-use plastic (SUP) items – supermarket polythene fruit/veg grocery bags. One nasty discovery has been that in many cases, plastic wrapped fruit and vegetables are less expensive than loose fruit and veg at the supermarket. For those of us wanting to help the planet and also watching the pennies this is a tricky conundrum. In an attempt to reduce our plastic dependency we’ve been opting for loose fruit and veg, but have been left with two tricky choices, should we a) let our greengrocery items roam free in the shopping trolley and on the conveyor belt, or b) put our loose fruit and veg in a polythene produce bag, which defeats the object of choosing loose produce in order to reduce plastic waste. In a bid to address this SUP problem we bought some mesh produce bags which are light, sturdy, reusable, come in different sizes and are see through to allow the cashier to scan items to the correct code. Whilst the bags are made of plastic, they are not single-use. There might be lightweight muslin varieties available, but cotton comes with its own set of environmental problems, albeit not plastic ones. It’s brilliant to read through Claire’s journey and the different experiments/items her family are using to help combat plastic waste. It’s very inspirational to read and has made myself look at my own plastic use and think of alternatives to the everyday plastic items. Excellent job Claire! Find out more about Plastic Free July here.